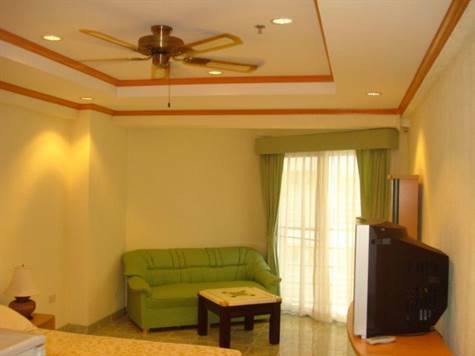 Jomtien Beach Condominium building A2 floor 5, on Jomtien Beach Road. Furnished Studio with bathroom, no kitchen. 1 air con, 1 ceiling fan, Wi-Fi Internet. Facilities include 24 hour security, 2 large swimming pools, 2 fitness centres, table tennis room, free bicycles, free aerobic classes, 6 restaurants, 5 bars, hair salon, laundry, 20 shops. Maintenance 300 Baht per month. For sale at 1.15 million or rent at 10,000 Baht per month. Foreign ownership. Our reference JTC1069.